Stirling University retained both the Smith-Murray and the Jack Allan Trophies at the end of the second and final day of the 95th Scottish Student Golf Championships over the Lossiemouth links of Moray Golf Club. Stirling's English-born, Moffat-based Gemma Batty emerged from an epic tussle with team-mate Sinead Sexton, a full Ireland international cap, to claim her third successive Scottish students' women's stroke-play title. 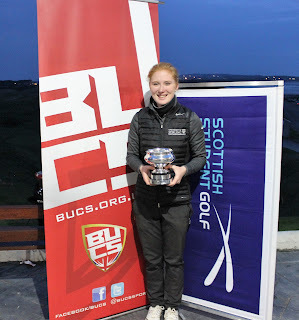 Having shared the lead all week, the two leading players in the women's field battled it out in breezy and cool conditions over the testing Moray Old Course, sharing eight birdies in a tense final round. It was Batty who emerged victorious, completing a final round of one-under 74 for an aggregate of six-under 286, two shots clear of Sexton with St Andrews' Alexa Hammer back in third place on 293. 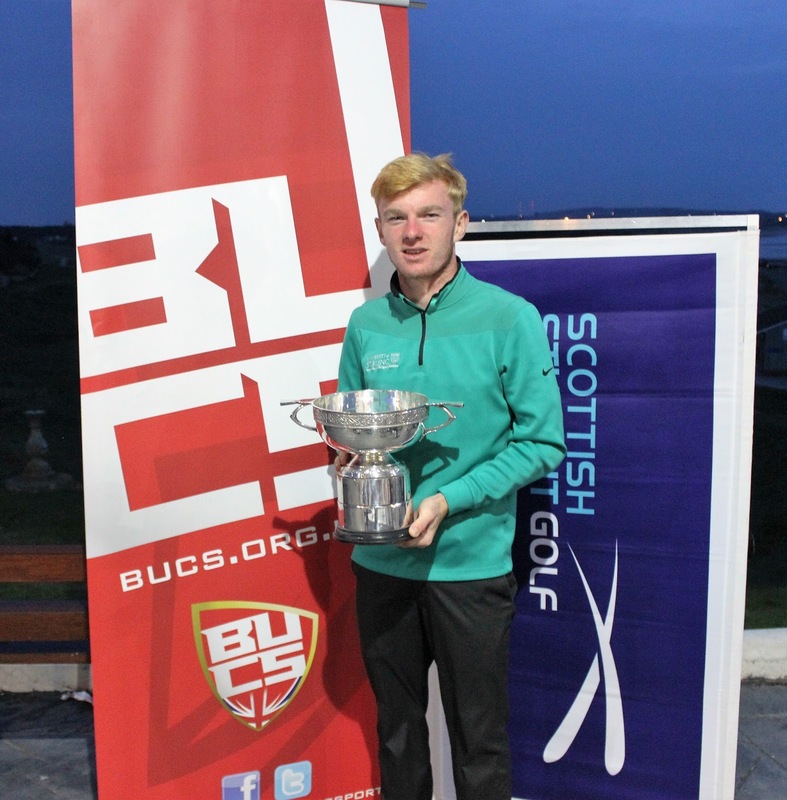 Batty is the first person to win three successive Scottish student golf titles since E-A Macgregor of St Andrews in 1971-73. Stirling University ace Laird Shepherd from Sussex surged to victory in the men’s championship event. With a three-shot lead at lunchtime after the third round, Shepherd would have been forgiven for a defensive approach to the final round, on what was a cold and tricky day on the Moray Old Course. Laird accelerated into a commanding position with a birdie 3 at the first and never looked back, reaching the turn in four-under-par, thanks to birdies at the fifth, eighth and ninth. He backed this up with an impressive back nine display in the fading light, adding a further birdie at the 15th on his way to the joint best afternoon round of 68. This gave Laird a six-shot winning margin and an impressive four-round total of eight-under 274. His final round score was matched by University of Highlands and Islands, Dornoh student Ricardo Cellerino. The Italian came through the pack with excellent last-day scores of 68 and 71 to finish second on a four round total of two-under 280. Shepherd and Cellerino were the only male students to finish under-par for the 72 holes. The golf continues at Lossiemouth today (WED) with the quarter-finals of the men's team match-play (morning foursomes, afternoon singles) and a knock-out individual match-play tournament for the women. 274 L Shepherd (Stirling) 67 66 73 68. 280 R Cellerino (UHI) 67 74 68 71. 283 C Maclean (Stirling) 70 68 71 74. 284 C Low (Abertay Dundee) 72 69 72 71. 285 M Myers (St Andrews) 68 71 74 72. 286 J Wilson (Stirling) 72 69 71 74. 289 R Foley (Stirling) 70 73 72 74. 291 P Kerr (St Andrews) 71 72 76 72. 292 J Harling (UHI) 761 73 74 74, C Edgar (Stirling) 75 71 74 72, J Sundborg (stirling) 73 68 78 73. 295 A Davidson (Stirling) 74 72 76 73, J Rogan (St Andrews) 74 74 75 72. 296 B Bojesen (St Andrews) 71 71 74 80. 298 N Young (RGU) 73 74 75 76, M Napier (Stirling) 73 71 78 76, A McDoyugall (Stirling) 78 71 74 75, R Paterson (Aberdeen) 68 71 82 77. 300 S Macgregor (St Andrews) 75 71 79 75, L Anderson (St Andrews) 73 71 81 75. 303 C Franssen (St Andrews) 672 72 78 81, T Hein (St Andrews) 70 74 79 80. 304 J Stoddart (St Andrews) 80 72 76 76. 306 F Asher (St Andrews) 73 75 80 78. 307 R Finlay (Strathclyde) 76 75 81 75. 308 L Frean (St Andrews) 76 75 77 80. 310 P Hasson (Glasgow) 80 71 78 81. 311 R Asher (Strathclyde) 72 77 79 83, G Minton (UHI) 77 72 80 82, A Benson (Strathclyde) 75 77 78 81. 312 E Innes (St Andrews) 77 73 81 81. 313 M Schinkel (UHI) 77 74 80 82. 314 D McIntosh (Aberdeen) 74 76 80 84. 317 M McGrory (Dundee) 74 73 83 87. 316 W Walker (Stirling) 76 71 84 85. 319 J Parker (Stirling) 77 71 86 85. NRs: G Joss (Aberdeen) 71 76 81 NR, B Bannerman (Glasgow) 74 75 80 NR. Withdrew: K McCormick (UHI) 74 74. 286 G Batty (Stirling) 71 71 70 74. 288 S Sexton (Stirling) 71 71 70 76. 293 A Hammer (St Andrews) 72 72 75 74. 301 T Mactaggart (Stirling) 74 74 75 78. 302 L Van Veggel (St Andrews) 75 70 73 84. 305 J Saxton (Stirling) 73 77 77 78. 307 N Greville (Stirling) 85 71 72 79. 312 F Clark (St Andrews) 77 79 72 84. 319 C Boa (UHI) 77 80 80 82.